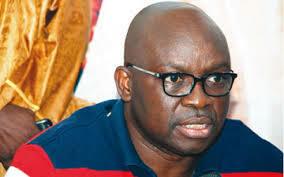 The state APC Publicity Secretary, Taiwo Olatunbosun, said in a statement on Thursday that Fayose had been misleading the public for long about the status of the case still pending at the Federal High Court, Ado Ekiti. According to him, the matter was transferred from Lagos to the Ado Ekiti Division of the court for adjudication and not dismissed. He challenged the governor to provide the court’s enrolment order discharging him on the poultry project case to convince the public. Olatunbosun said the party’s reaction to the governor’s claim became necessary to draw public attention to the true position of the matter. The party spokesman added, “It is regrettable that Fayose has made lies and falsehood a major plank of the state policy of his government. “There is no iota of truth in Fayose’s claim of acquittal as no court has delivered judgment on the matter, which is still pending before the Federal High Court, Ado-Ekiti. “The case was last heard by Mr. Justice Adamu Hobon of the Federal High Court, Ado-Ekiti, where the EFCC gave a blow-by-blow incontrovertible evidence of how Fayose used Biological Concepts Limited, owned by his friend, Gbenga James, to defraud Ekiti State of N1.3bn to build houses and purchase car for his mother. “After that sitting, what Fayose did was to approach the Supreme Court for an interlocutory injunction to frustrate the trial. This is not the same thing as being discharged and acquitted over a matter that judgment is yet to be given,” he explained. Olatunbosun explained that the matter had reached the stage of exchange of addresses to be followed by judgment shortly before Fayose emerged as the governor-elect in June, 2014.